Are you depressed Tony Hawk’s Pro Skater 5 didn’t end up being the return to the series’ glory many hoped it would be? So where do you turn to get your video game skateboarding fix in this modern era devoid of the once great Tony Hawk’s Pro Skater seriers? Console gaming options are relatively non-existent, unless you’re willing to go back to Skate 3 on the Xbox 360 or PlayStation 3, and who actually wants to do that? While this might come as a surprise, to heal the pain of the disaster that is Tony Hawk’s Pro Skater 5, I ended up turning to a mobile skateboarding title called True Skate. True Skate has been out for a number of years now and was originally released back in 2012, however, the mobile game’s developer, True Axis (the same team behind Jet Car Stunts 1 and 2), continues supporting the game by releasing multiple updates, as well as additional downloadable parks. Gameplay in True Skate is relatively simple, and while the game has more in common with EA’s realistic Skate franchise, it’s a great on-the-go substitute for people looking for an entertaining skateboarding game. In True Skate, players perform kick flips, heel flips and pop shove-its (as well as a slew of other strangely named skateboarding tricks), accomplishing specific goals, as well as reaching high scores. 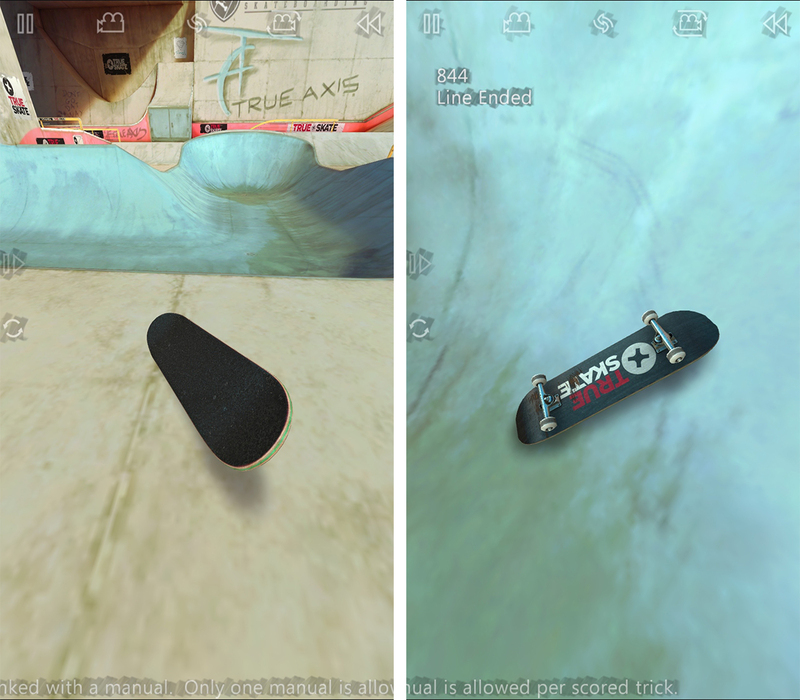 What makes True Skate stand out from the various other mobile skateboarding titles on both the Android and iOS App store is the game’s realistic physics system. In True Skate, your virtual skateboard reacts to the player’s flips, pushes and epic crashes, just as you’d expect a plank of wood with wheels attached to it – also known as a skateboard – perform in the real world. And amusingly, visually the game is probably better looking than Tony Hawk’s Pro Skater 5. There’s something inherently fascinating about flipping your board through the air, with a subtle swipe across your mobile device’s screen, and then hopefully nailing the perfect combo you’ve been attempting for the last 20 minutes. It’s sad a mobile game released in 2012 is better than Tony Hawk’s Pro Skater 5, but it’s true. Each skatepark also has a seemingly countless number of missions to accomplish, however some of these tasks will likely be nearly impossible for the average player – True Skate is not an easy game. True Skate is available on Android for $2.59 and iOS for $2.29. Additional skate parks cost between $1 and $2, but multi-packs are also available.